For two decades UNEARTH has been storming the metalcore front, blazing a relentless trail of tours and festivals, including Ozzfest, Rockstar Mayhem, Sounds of the Underground and MTV’s Headbangers Ball, sharing the stage with veterans such as Slipknot and Slayer – all of this on top of impressively selling over a half a million albums worldwide. Their sound largely influenced the metalcore movement itself without sacrificing individuality, UNEARTH has seven studio albums to date, “The Stings of Conscience” and “The Oncoming Storm” both solidifying their place in the scene. “Extinction(s)” is an album every bit as political as their previous endeavors – an outspoken critique of the wrongdoings of our world and touches on the subjects of the inescapable nature of death, loss and tragedy. “Incinerate” opens with your stereotypical metalcore riffage of grooves interspliced with dissonant chords. Overall, it is a powerful jumping point for the record and features some wonderfully executed sweep picking. “Dust” is a more straightforward jam that fleshing out some two-steppy riffage that is completely danceable. “Cultivation of Infection” tones it down with a simple clean guitar riff with heavy reverb. The song quickly picks up with a another dissonant groove that echoes throughout, with hypnotising melodies to keep things diverse. “King of the Arctic” is a dramatic undertaking the features a rollercoaster of emotions, all behind the expected grooviness expected from the metalcore veterans. “Sidewinder” shows off that the five pieve is capable of darkly brutal riffage that greatly resembles THY ART IS MURDER, some very chunky mid-tempo riffage that does not let up for the final minute which is a slow building breakdown that slaps the listener in the face, only to have a further beatdown on “Hard Lined Downfall” to finish the album on a truly aggressive note. 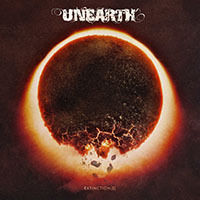 Overall, UNEARTH stays true to their signature form and their seventh chapter will surely satisfy long term fans, but at the end of the day, the album features a lot of stereotypical riffage to the metalcore genre that many die hards will roll their eyes at and it is a wonder why they would continue to beat this dead horse after twenty years.